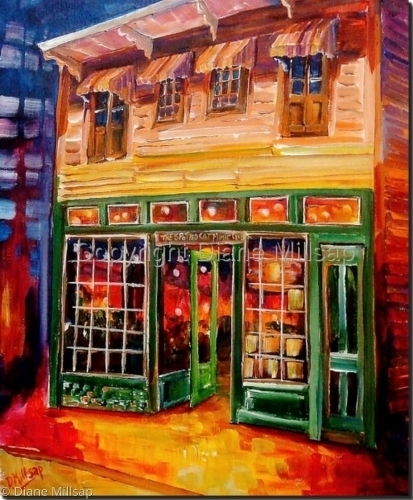 SOLD: New Orleans' Decatur Street takes on a glow from shops and small cafes as night descends. Large original oil on gallery wrapped canvas. 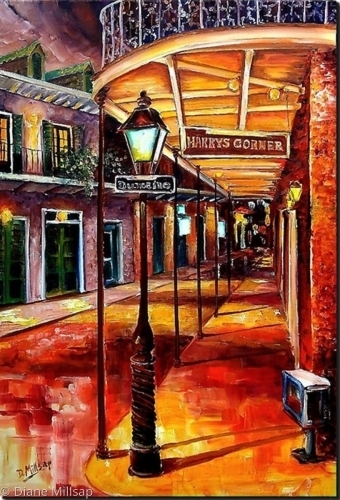 A favorite with the locals, this French Quarter restaurant is located on the beautiful, tree-lined Esplanade Avenue. This original oil is painted in a modern, impressionist style with glowing colors. Small, dark, and funky, New Orleans' "Spotted Cat Music Club" is the place to be! 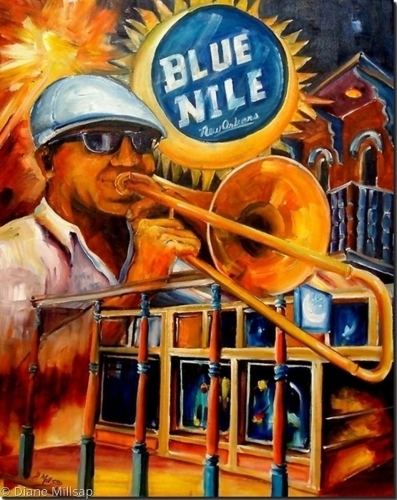 FOR SALE: Home to the hip Jazz/Blues/Funk music scene, the Blue Nile in the Marigny neighborhood is THE place to be! 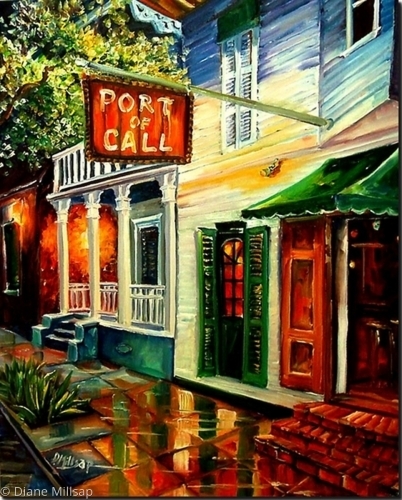 This original oil on a gallery wrapped canvas captures that special atmosphere on Frenchmen Street. $595.00 on Ebay. 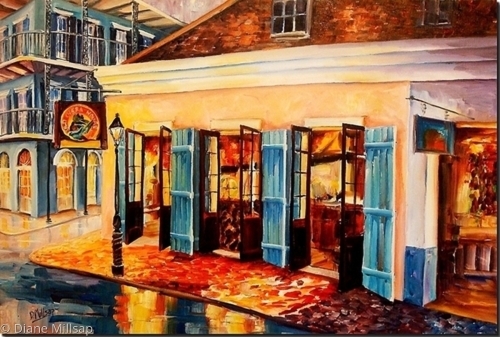 This very large original oil captures the glow from New Orleans' famous Pat O'Brien's Bar. Painted on a huge gallery wrapped canvas, this brilliant work is alive with color and spark. The edges of the 1 1/2" deep canvas are also painted so this painting may be hung if desired. A picture wire kit is also included. This is an original, and Diane's certificate of authenticity will be enclosed. 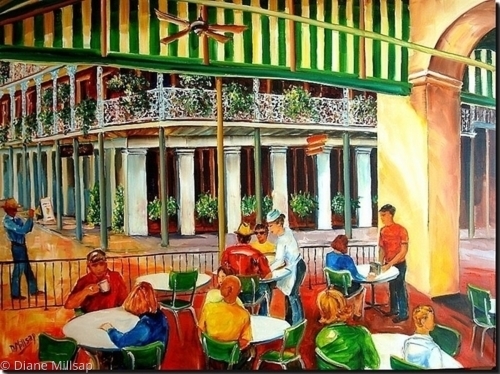 Patrons of New Orleans' famous coffee stand trade gossip and sip their early morning coffee. 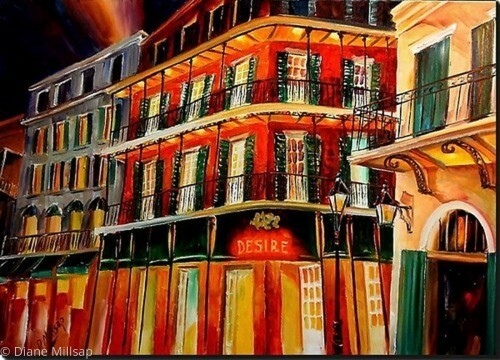 The old doors opened wide and the glow of the lights welcome those who hold New Orleans in their hearts. 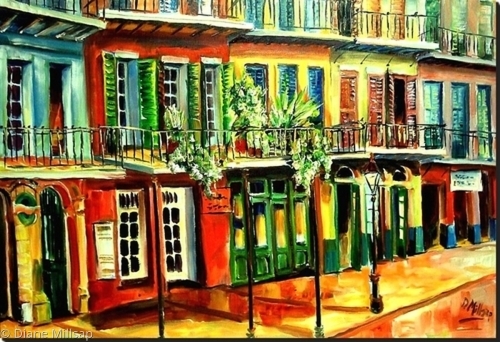 Painted in a modern impressionistic style, this large original oil captures the excitement of the bold French Quarter streets. 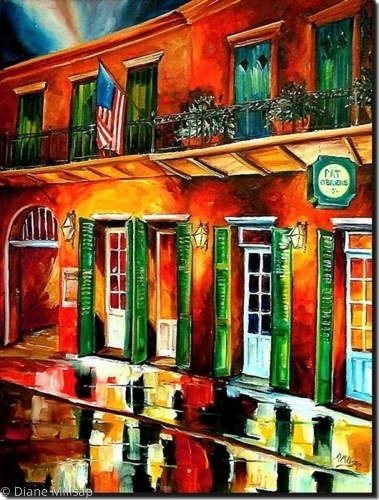 Pat O'Brien's Courtyard in the French Quarter is a favorite with tourists and locals. 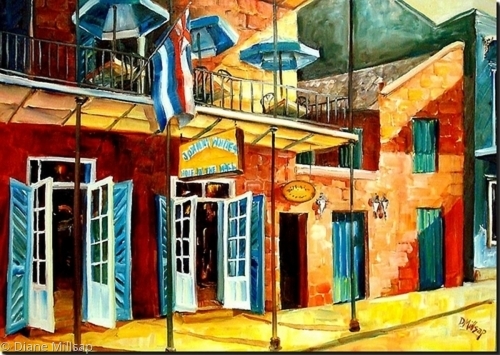 This original oil painting captures the sunny relaxed atmosphere of this well known New Orleans spot. 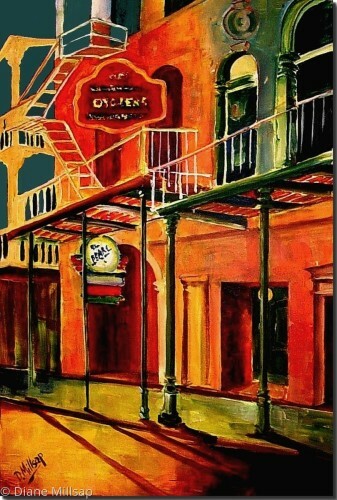 Harry's Corner Bar, an institution in the French Quarter, is the site of much merriment all hours of the day and night! Deep red, brown, and burgundy tones create a feeling depth and a sense of mystery. 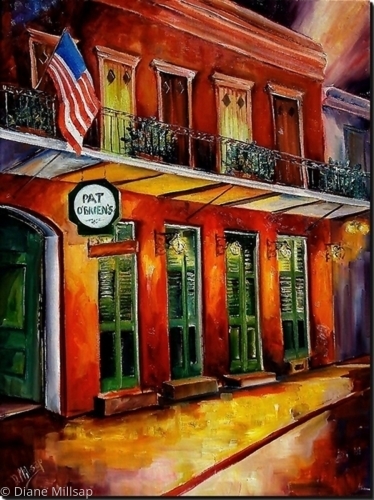 Large, vibrant original oil painting of Pat O'Brien's in the French Quarter, home of the world famous "Hurricane." 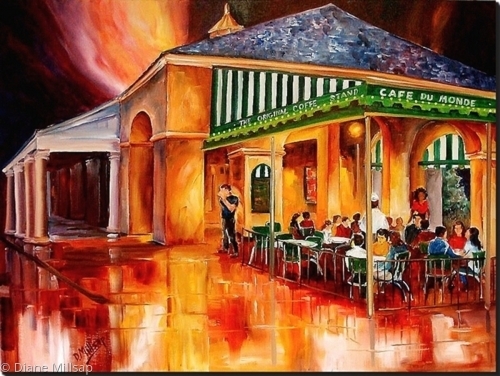 Gleaming wet streets and the glow from the Cafe Du Monde Coffee Stand are well known images of the French Quarter at night. 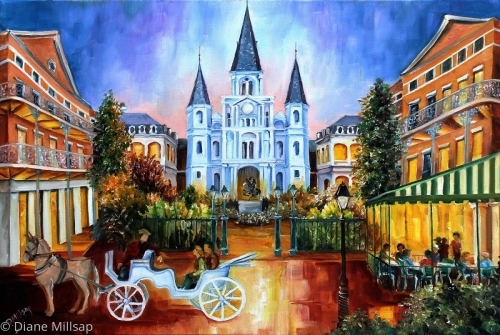 Painted in Diane's modern impressionist style, this large original oil is classic New Orleans. This painting may be hung unframed, if desired. (The edges of the 1 1/2" deep gallery wrapped canvas are also painted, and a picture wire kit is included. Certificate of authenticity enclosed. 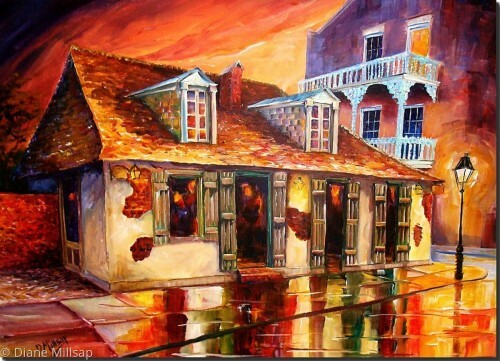 The time-worn walls of the old Napoleon House reflect the rich history of the French Quarter. Layers of translucent oil paint are used to create an air of mystery. 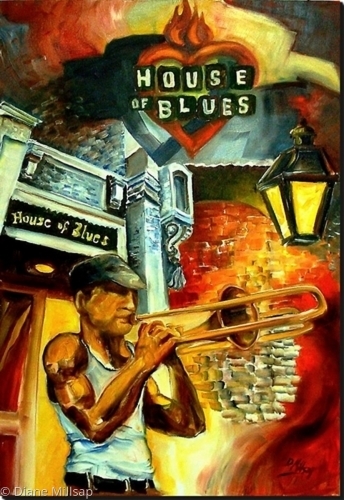 The Old Opera House on Bourbon Street , which just happens to be an excellent example of 200 year old Creole architecture, is a great venue for local New Orleans musicians. Painted in oil on a gallery wrapped canvas. Ready to hang. Floodlights illumine the facade of the world famous Brennan's Restaurant in the French Quarter. 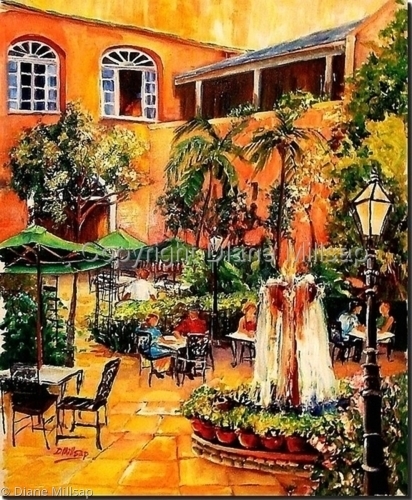 Painted in a modern impressionist style, this piece captures the scene in vibrant color. This painting is done on a gallery wrapped canvas and may be hung unframed. Johnny White's, a local watering hole in the French Quarter, offers some shade from the afternoon sun and a tall cool drink too. This large original oil is painted in Diane's modern impressionist style with broad brush strokes and bold color. It may be hung unframed. The edges of the 1 1/2" deep gallery wrapped canvas are also painted, and a picture wire kit is included. This is a one-of-a-kind original and a certificate of authenticity will be enclosed. 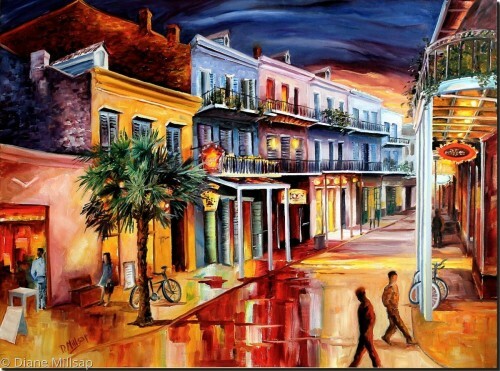 A bold and colorful view of New Orleans Decatur Street is depicted in this large orginal oil. 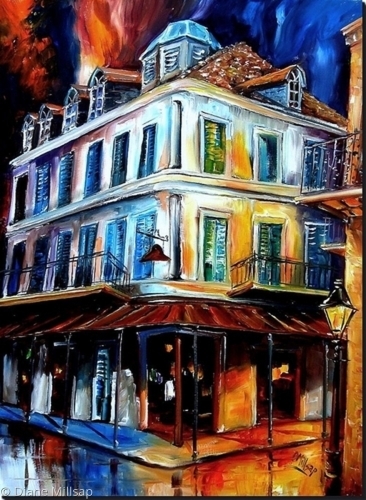 Painted in an abstract-impressionist style, this work is captures the the spirit of the French Quarter. It may be hung unframed. The edges of the 1 1/2" deep gallery wrapped canvas are also painted, and a picture wire kit is included. Time and a little disrepair do not diminish this proud building in the old French Quarter. 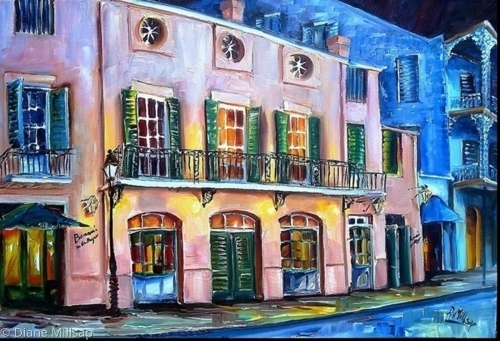 The brightly painted stucco walls and shutters are joyous against a beautiful New Orleans sky. This work, painted in high quality acrylic pigments and sealed with a satin varnish. It may be hung unframed if desired. The edges of the 1 1/2" gallery wrapped canvas are also painted, and a picture wire kit is included. Oil on gallery wrapped canvas. 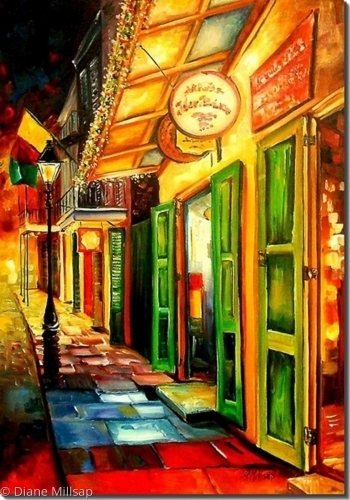 A vibrant original oil painting of New Orleans' famous Bourbon Street painted in Diane's modern impressionistic style. 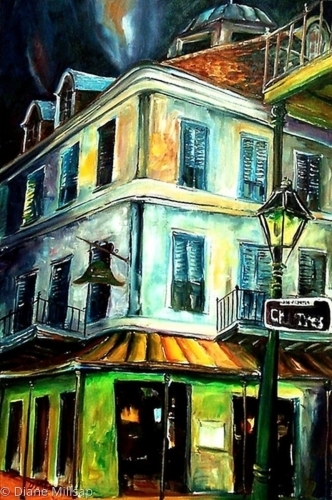 SOLD - New Orleans' famous Lafitte's Bar glows at night, illuminated by the gas lamps on Bourbon Street. Acrylic on stretched canvas, ready to hang. Please contact me for purchasing information. 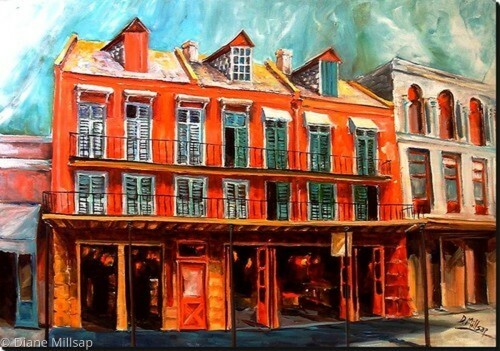 FOR SALE: One can immediately recognize the silhouette of New Orleans' old oyster bar, "The Pearl" which has been in business since the 1920's. This oil on canvas is painted in a semi-abstract style on a 1" deep gallery wrapped canvas and is ready to hang.